I doubt I have ever been less prepared for a long route. After a spell of bad weather the skies cleared and the outlook was good for a few days. Having been busy I hadn’t made any plans. As the morning rolled on and no-one was free to get out I was getting a little frustrated. I was starting to give up hope when Tom Grant texted back saying he couldn’t come skiing as he was heading up to the Drus. I remember hesitating and shivering a little at the idea as I was quite sure conditions were a bit thin. However with nothing to lose I asked if I might join, not even knowing who he was climbing with. An image taken from video still earlier in the summer, route marked. Tom was climbing with a friend from Tasmania, Kim Ladiges, who had several mutual friends, so I looked forward to meeting him. We planned to meet at the Montenvers train two hours later at midday, to give us the afternoon sunlight to walk into the excellent bivi spots at the base of the Drus, on the Rognon. The ensuing gear explosion consumed my living room and kitchen. As we were planning to descend the same way I didn’t pack lightweight camping gear, and so my bag was colossal. 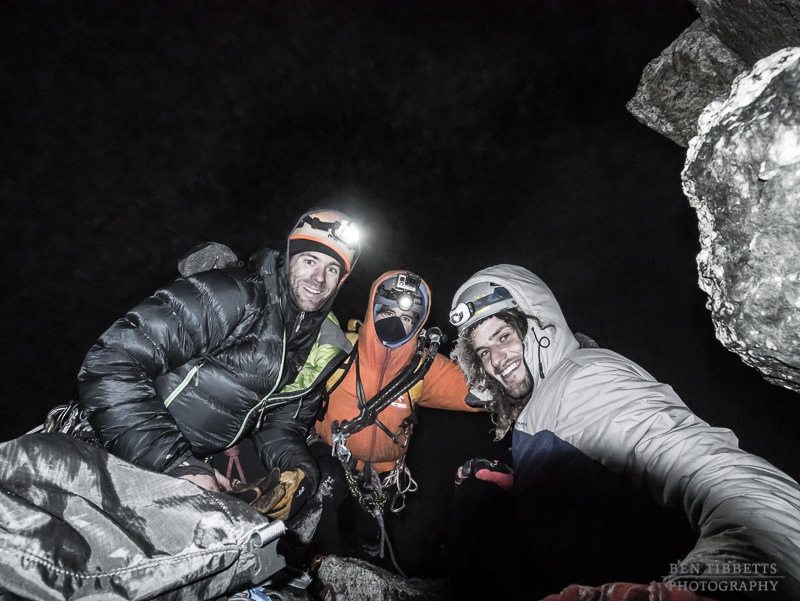 Climbing as a team of three is great for several reasons. 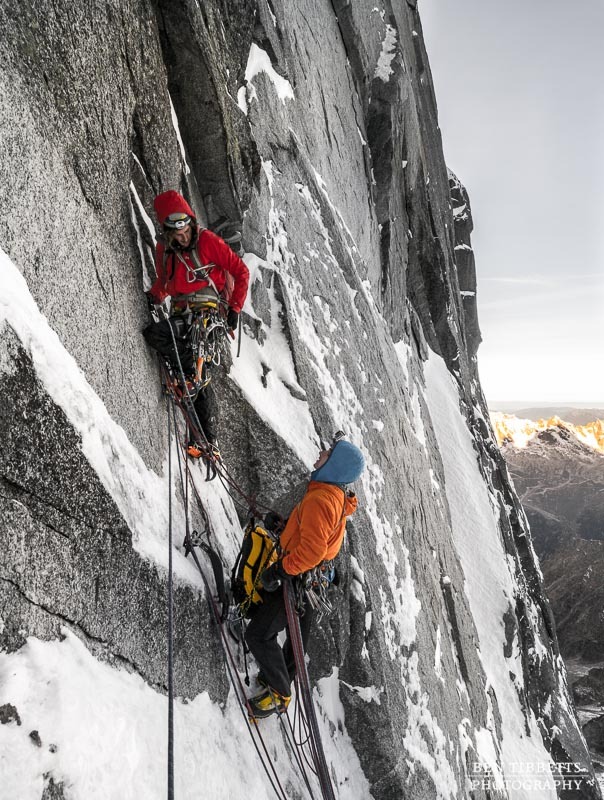 Firstly at belays you don’t need to stand alone and slowly psyche yourself out about your next lead, but equally importantly you have three people to divide up the workload of leading and carrying the gear into and up the route. Or so it should be, yet somehow on the walk in Kim seemed to end up with a disproportionately huge bag. The walk in to the base of the Drus is a bit of a ball-buster. A narrow and intermittent track splits left from the Charpoau path, through the undergrowth then finally disappears at the base of the moraine of the Glacier des Drus. From here up to the right bank moraine of the glacier is loose scree and boulder-fields. 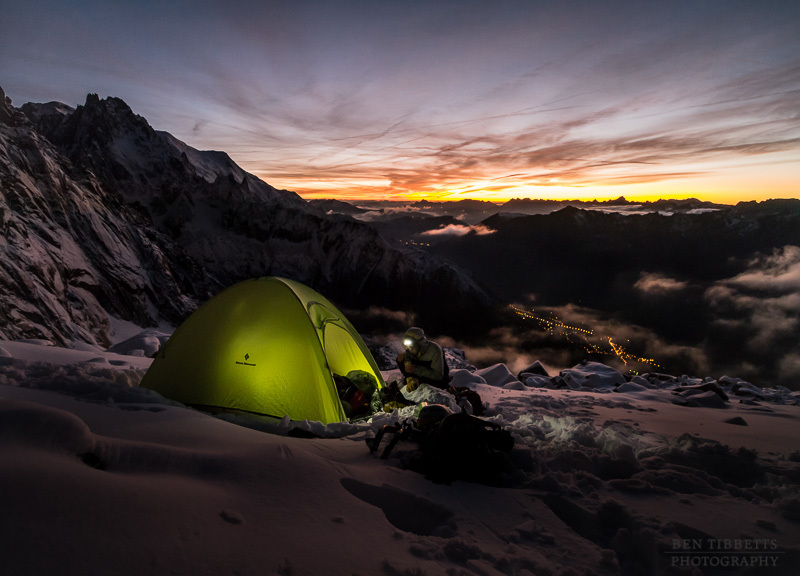 After a scrambling step you finally reach the Rognon, atop which are some fantastic bivouac spots, and one of the finest sunset views in the valley. 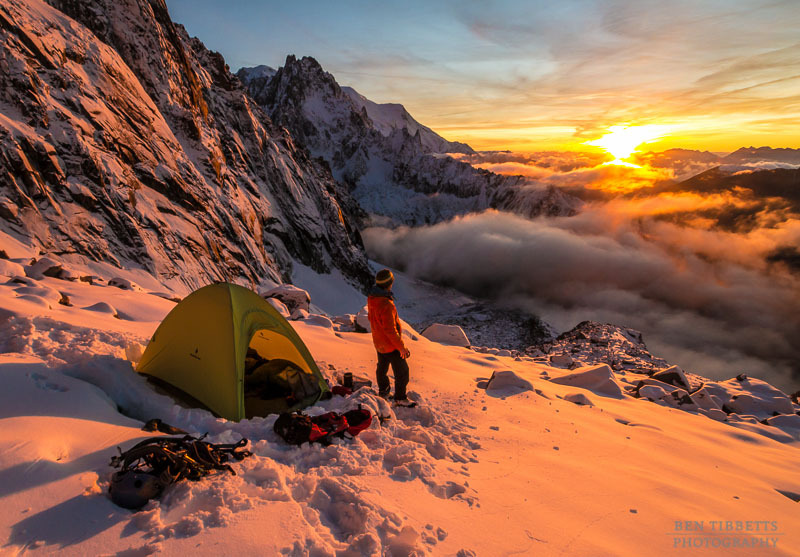 We were surprised to find ourselves in the cloud most of the way up, but gratefully emerged at the bivi sites above the inversion, and were treated to one of the most outrageous sunsets I have seen. Or rather my camera lenses were, as I spent the entire time watching the glorious light through the camera, snapping away until it finally got dark. Kim and Tom were more prepared than me and had a bivi tent. 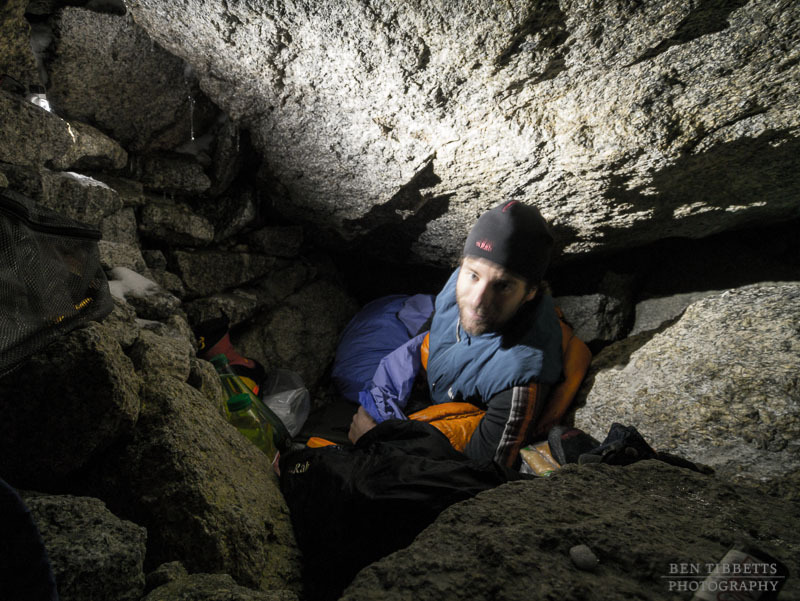 I slept in a rather insalubrious cave under a boulder. With a mouse. We got up at 2.30, set off at 3.30 and shuffled up the glacier to the base of the route. The conditions were surprisingly benign, except for one committing leap over a thinly bridged crevasse, which was the size of a village. The air was still and the night clear and star-filled. 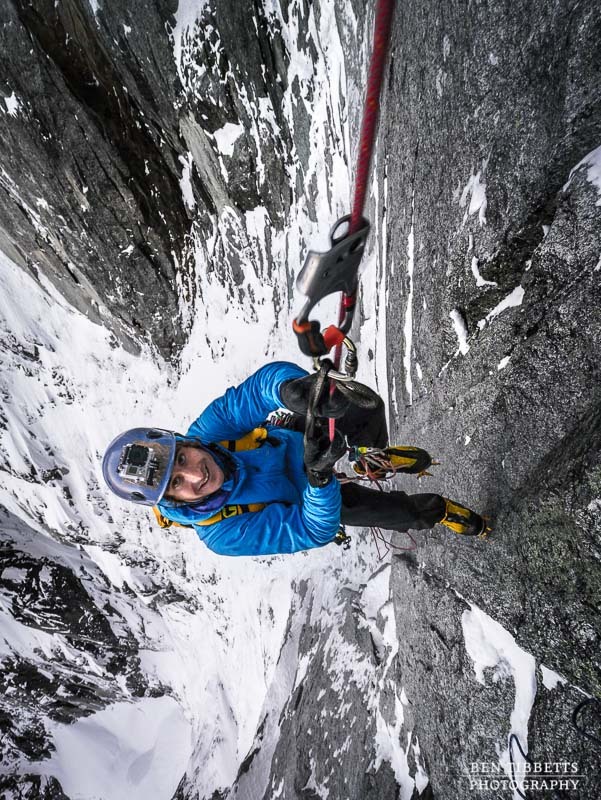 We geared up above the rimaye, which passed easily and Tom set off up the first pitch. 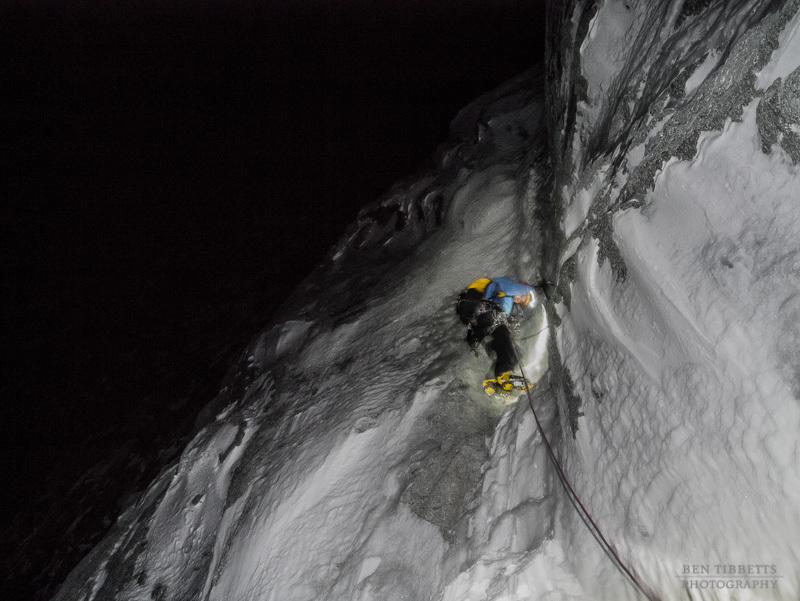 From the first ice runnel, which was brittle and thin, right up to the headwall Tom led up simul climbing, placing protection and ‘ropemen’ belays where possible. 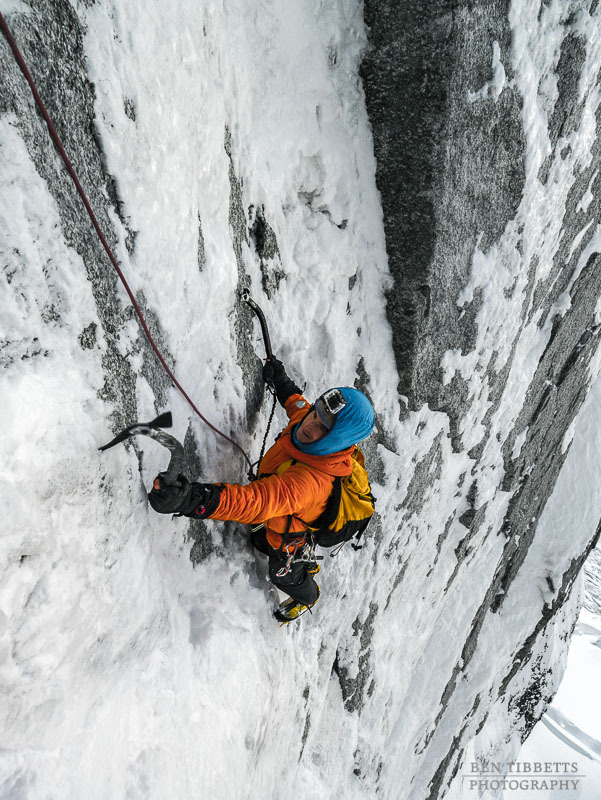 Most of the climbing was straightforward, but the last hundred metres below the headwall were thin runnels of loose ice up some slabs. At the rock bastion Kim took over and dispatched the aid climbing of the Nominé crack with speed. It can be climbed with an intermediate belay, but Kim ran it in one pitch. I was humbled by the audacity of Cecchinel and Jager to force a line up through here in the middle of winter 40 years ago. Now there are innumerable pegs insitu and very little other aid/protection was needed. Kim ran out of quickdraws however and was soon clipping the pegs with single carabiners. 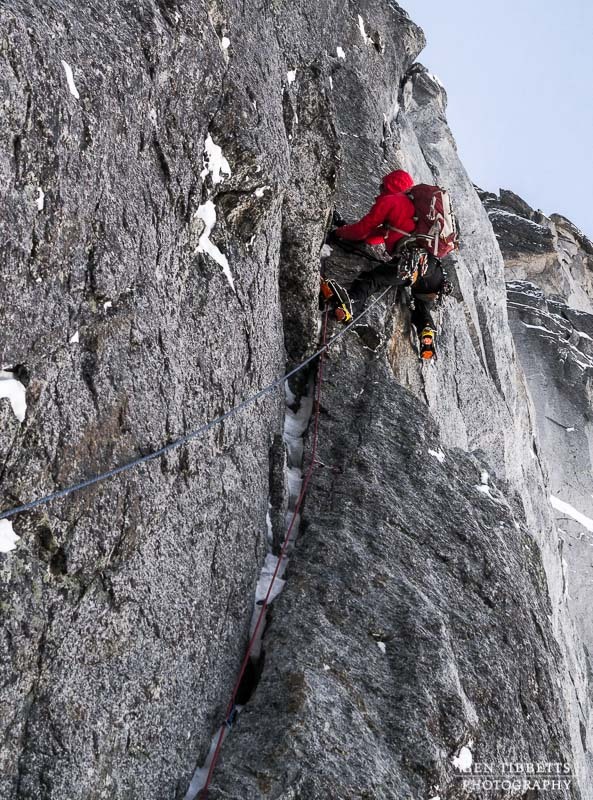 Kim setting off up the Nominé crack. 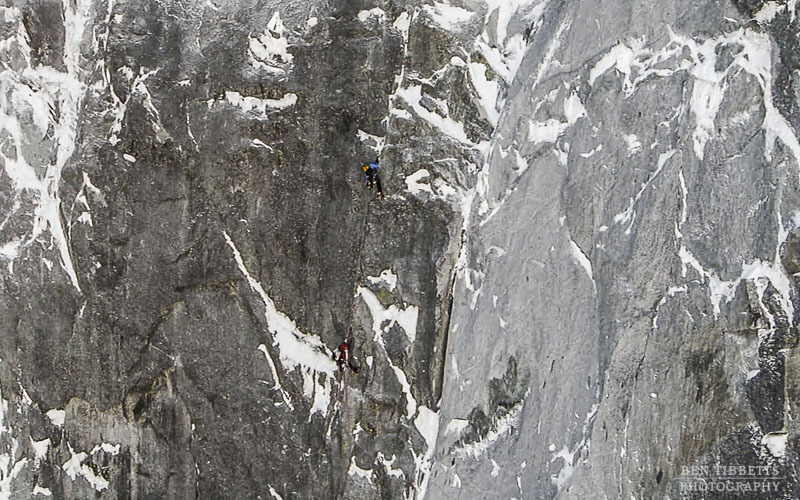 A video still shot from heli this summer, showing some friends on the Nominé. A photo topo of the rock bastion on the Drus North Couloir. Belays marked as dots. 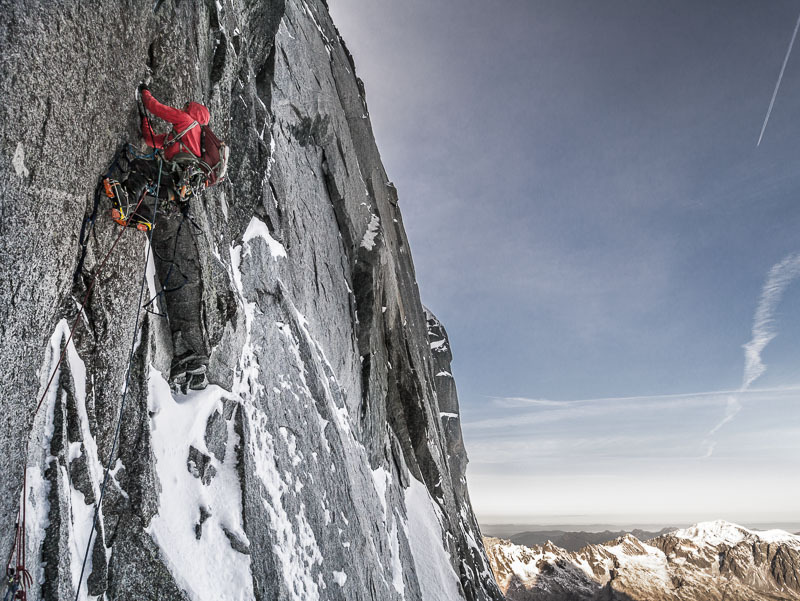 Tom had climbed up these rock pitches last year which was a blessing. After the first aid section there are several bits of tat in the terrain above that are evidence of from folk rappeling off having taken the wrong line. 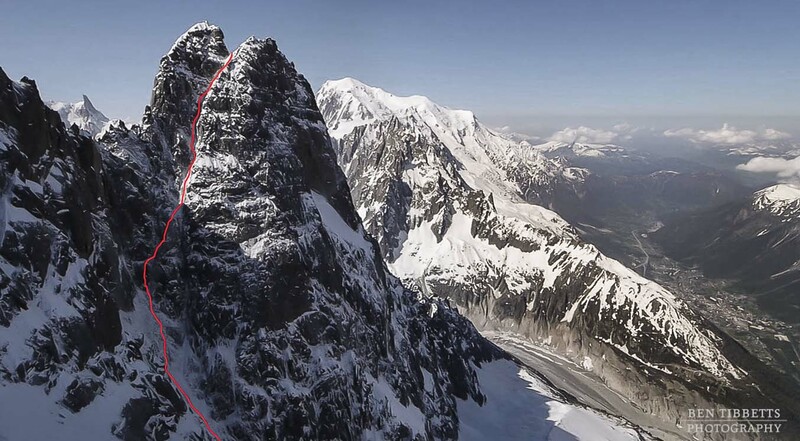 The right line to take isn’t obvious, but is a long pitch that traverses hard right for 20 metres before continuing up a steep crack system then right again, across slabs to the base of an offwidth. Tom led up this which is currently mostly dry and quite tricky. It wasn’t particularly surprising, given current conditions in the massif, that when we arrived in the upper couloir things looked a little dry. I took over the lead for a block of pitches. To start with it looked like we might be able to simul climb to the top quite quickly. However there was only a superficial layer of unconsolidated snow on increasingly tough brittle ice so we pitched it out. Tom arriving onto the upper couloir. By this time cloud had rolled onto the mountain, and I had given up taking photos. 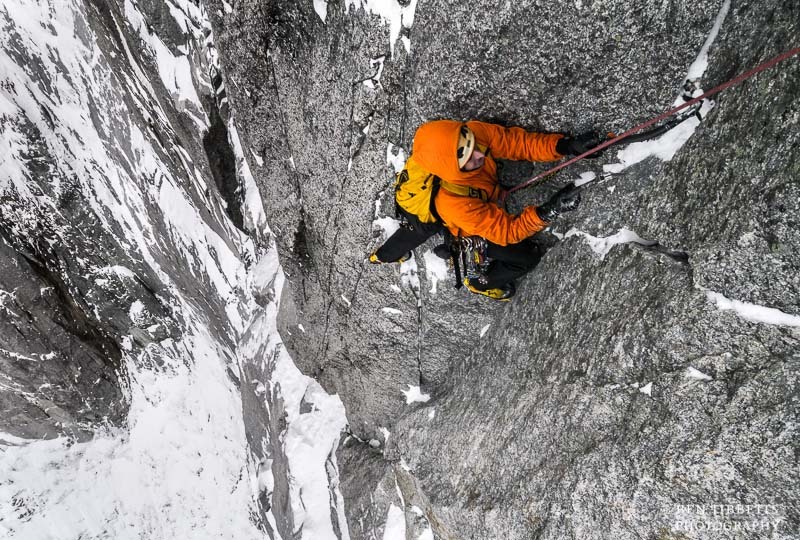 After a couple of pitches, passing the ‘s-bend’ in the couloir there was a mixed step that looked fairly benign from below. When I got involved it turned out to be quite a steep groove, capped by a large block and an unsupported snow mushroom. 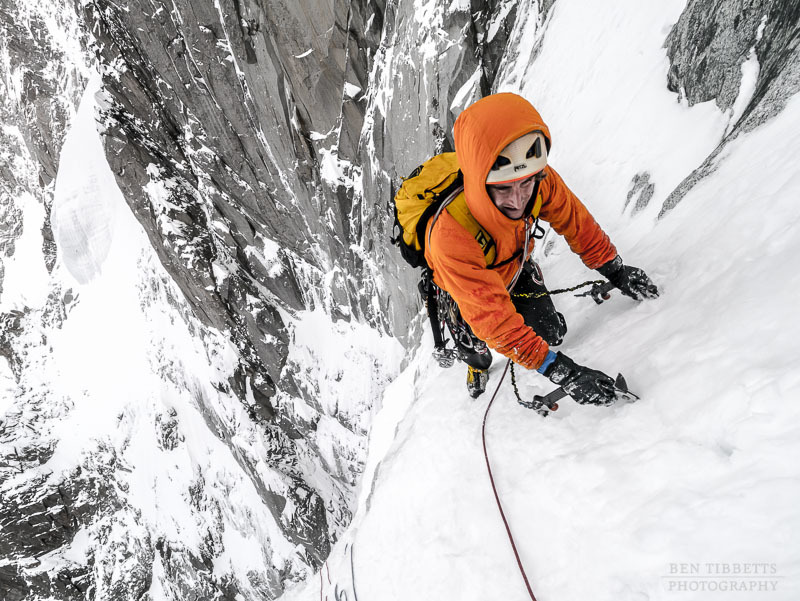 Having spent a considerable time in the wrong gloves hacking this out the way I escaped out into the couloir above and collapsed on the belay, my fingers frighteningly numb. For a good while I lolled in nauseous pain as the blood began to slowly recirculate. A few pitches of bullet hard ice later, and back into darkness we arrived thankfully at the top, and begun the 15 or so rappels back down the face. The way back down took a very long time. 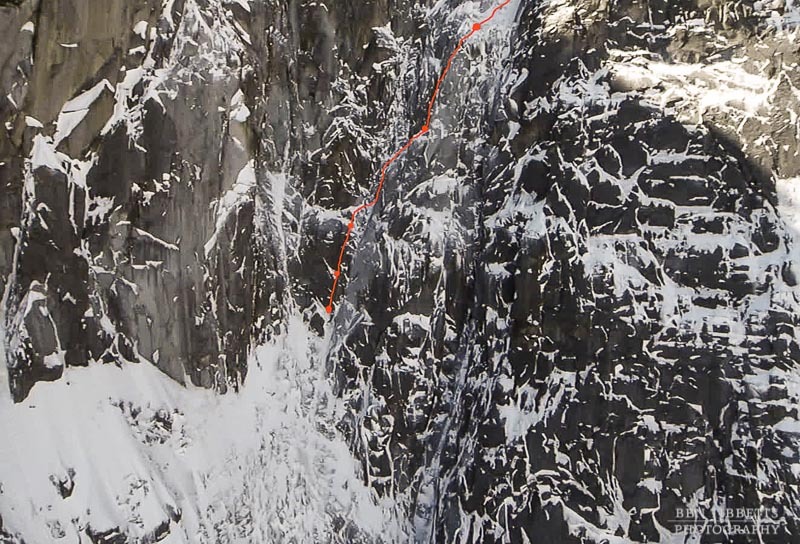 There were no v-threads in the upper couloir, but more surprisingly many of the belays down the rappel line of the ‘Direct’ route had been blown out, presumably by rock-fall. So we had to spend some time rebuilding them, leaving gear and getting down safely whilst very tired. Back at the bivouac I have never been so happy to crawl under a boulder. Thanks guys for a great adventure! Hello Ben it’s Julien, we met in Cham in July as you were our model during a photo workshop with Tristan Shu and Laurent Soyris for a bouldering session. 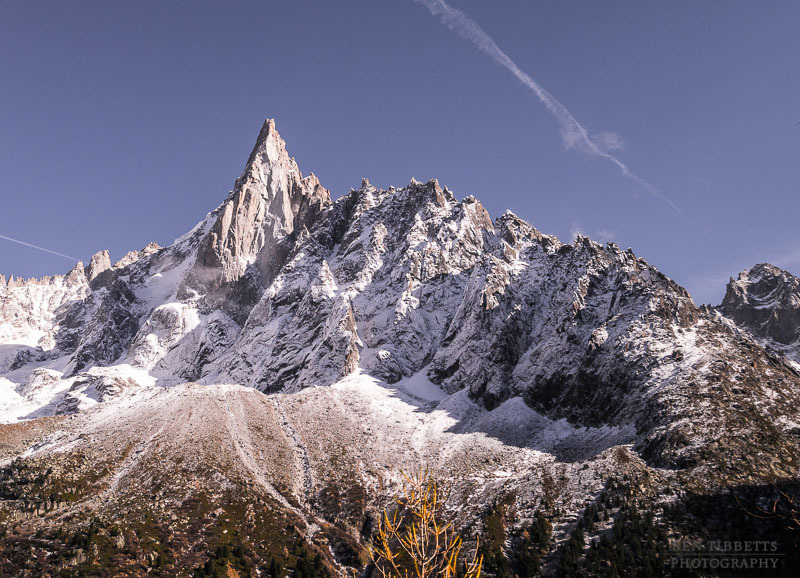 I just discovered your blog and wanted to thank you for sharing your alpine adventures. Be sure you a have a new fan. By curiosity, what photography gear did you use for this route ? Have a great winter, I just can’t wait for ice and snow ! !